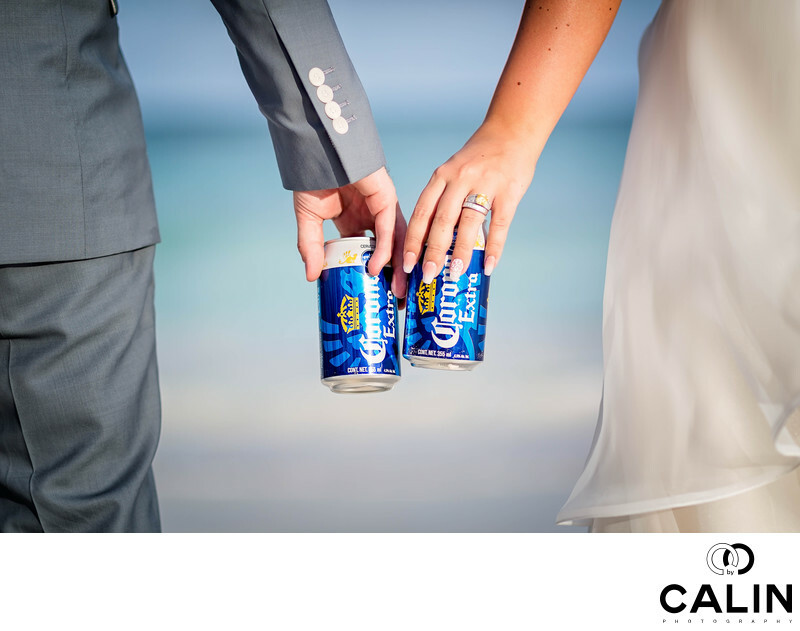 This is a funny image of the bride and groom, each holding a Corona beer. I took this image during a Barcelo Maya Palace Deluxe wedding portraits session. The photo is a close-up of the bride and groom's hands holding two Corona beers. The fact we can not see the couple's faces increases the mystery of the photo. During the photo shoot I did on the beach next to Captain Morgan, I thought about this creative photo. As such, I asked the bride and groom to grab two beers from the car and hold them close together. From a composition standpoint, this is a balanced photo. We can see part of the groom on the left, the bride and groom's hands holding beers in the middle and part of the wedding dress on the right. The hands for leading lines tours a two beers and many viewers of this picture said it looked like a Corona add. As wedding photographer I always work under severe time constraints and this photo shoot was no different. This image is an available light wedding photo captured with a Canon 85 mm F1.2 shot at F2.5. I specifically chose a shallow depth of field to emphasize the subject (the hands holding the two Corona beers). In terms of post processing the but the vignetting, softened the bride's hand and sharpened the wedding bands in the beers. What Makes This Image Special? As a Toronto wedding photographer, I always attempt to create stunning imagery for my couples. First, it is a composition. In this image I chose to break the rules and created a central composition picture. Second, it is an unusual picture because it doesn't show the bride and groom's faces. Third, the colours of the environment match the colours of the beer: the blue matches the ocean, the White matches the sand and the yellow the sun.